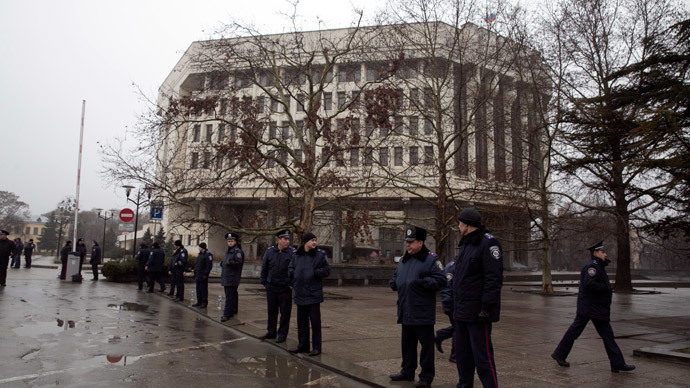 The self-defense squads that raided Simferopol International Airport during the night have left the airport terminal, but are still patrolling the grounds outside. Airport security says the squads are helping to ensure safety. Crimeans began protesting after the new self-proclaimed government in Kiev introduced a law abolishing the use of other languages in official circumstances in Ukraine. More than half the Crimean population are Russian and use only this language for their communication. The residents have announced they are going to hold a referendum to determine the fate of the Ukrainian autonomous region. 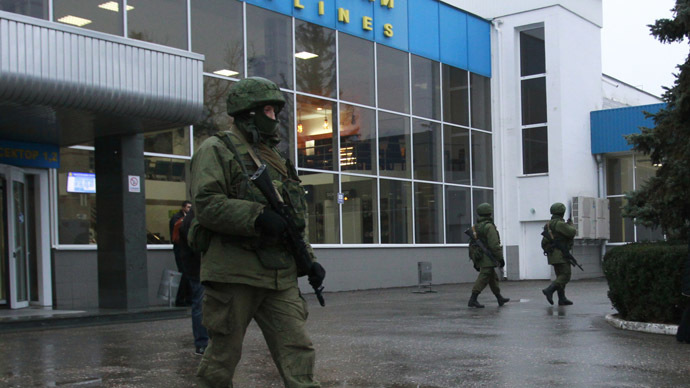 The head of the Simferopol airport security service, Vladimir Perepelitsa, said that the people now patrolling the territory of the airport are calling themselves “self-defense squads” and their intention is to prevent possible turmoil. Maksim Pastukhov, a correspondent with RT’s documentary channel who is now at the airport, has also reported that it’s being patrolled by self-defense squads, adding that they in no way are hampering the airport from operating flights according to schedule. “It’s all quiet inside the airport,” he said. “There are much fewer armed people outside than there were in the morning." The people patrolling the territory of the airport did not mind being filmed. Only a few spoke to the journalists though. AP managed to interview one person, who said he was member of the People's Union of Crimea. Speaking later to the Dozhd (Rain) TV channel, Stratilati said those people weren’t from the Russian military. He added about 30 of them were still outside the airport. Later reports appeared of Belbek Airport near Sevastopol being seized by a group of unidentified armed people. The Russian Black Sea Fleet denied allegations that the Russian military were involved in any storming operations. "No units of the Black Sea Fleet were deployed in the area of Belbek [Airport], nor did they take any part in seizing it," a statement from the fleet's press service reads. 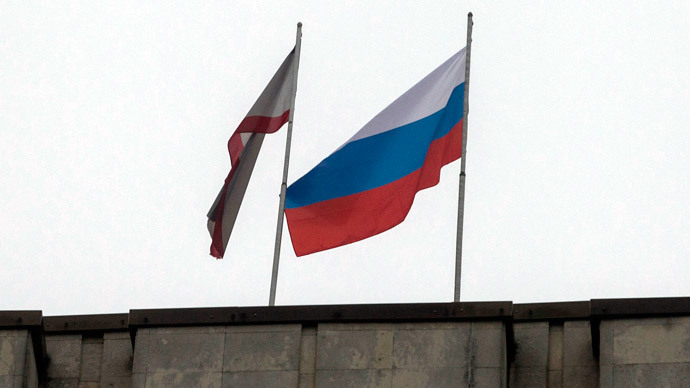 Crimean PM Sergey Aksyonov says he has situation at both the Simferopol and Sevastopol airports under control. The Autonomous Republic of Crimea was made part of Ukraine only in 1954 by decree of Soviet leader Nikita Khrushchev, himself an ethnic Ukrainian. 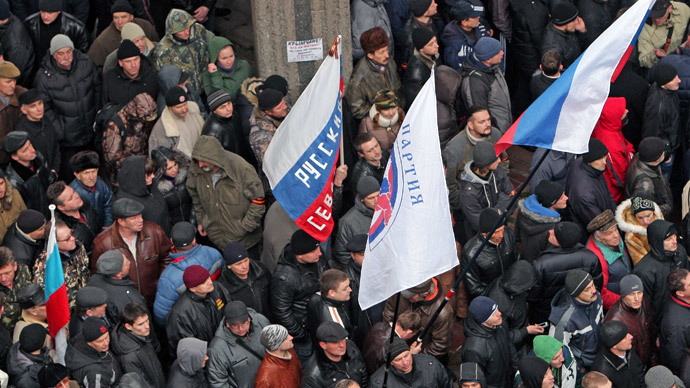 The majority of those living in Crimea today (around 58 percent) are ethnic Russians. 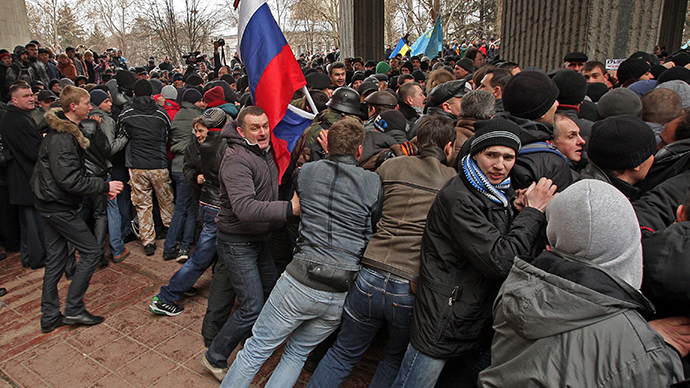 Turmoil in Crimea began with the ouster of President Yanukovich, as most of the population in the autonomous region have been skeptical of the new Ukrainian government. Even more so, since the Ukrainian parliament voted to repeal a 2012 law which allowed predominantly Russian-speaking regions of Ukraine to use Russian in official business, education and some other areas. 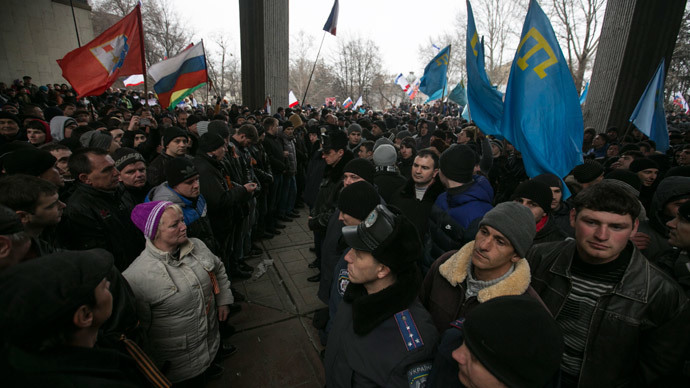 Thousands of pro- and anti-Russian demonstrators clashed in front of the parliament building in the Crimean capital, Simferopol, on February 26, leaving two people dead and at least 30 injured.